“Jab naam ke alaava kucch bacha na ho toh naam ko bacha bacha ke chalna chahiye (When you have nothing left but your name, you would do well to fiercely protect that name),” says a nautch girl to an arrogant aristocrat in Saheb Biwi Aur Gangster (SB&G) 3. 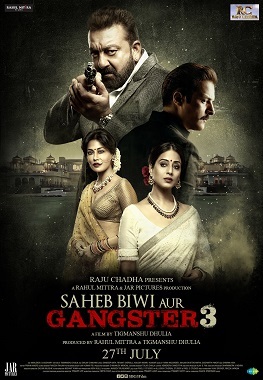 The effect is lost in translation, but in Hindi this is the kind of zinger written and delivered without sounding self-conscious and bombastic that made Saheb Biwi Aur Gangster (2011) and its sequel, SB&G Returns (2013), such fun to watch. Five years after Jimmy Sheirgill, Mahie Gill and Irrfan Khan crackled and popped on screen in Tigmanshu Dhulia’s second film of the series, comes the third. Sheirgill and Gill remain the saheb (master) and biwi (wife) of the title. The gangster played by Khan is gone, of course, and in his place arrives Sanjay Dutt, a once charismatic superstar with a sensitive face who has, in the past decade, allowed himself to become a listless, lumbering giant barely able to move a limb or a facial muscle. As every Bollywood buff knows, these lyrics allude to Dutt’s infantile real-life nickname, which serves to stress his public image of an overgrown, golden-hearted baby who is too innocent to know what he is doing when he messes up. There is not an atom of fierceness in the teddy-bear-like sobriquet, so using it in this film makes no sense since he plays a royal with a reputation for ruthlessness and violence here. This is the first hint of Dhulia’s seeming disinterest in this project, which appears to have been slapped together to give everyone on the team something to do. In SB&G3, we are back with Aditya Pratap Singh (Sheirgill), member of a former princely family trying to retain some significance by having a political career in a post-Independence India that no longer recognises royalty and titles although the families themselves hold on to “His Highness”, “Yuvraaj”, “Kunwar” and other dregs of an era long gone. Aditya has been away in prison, while his first wife Madhvi (Gill) honed her own skills as a politician and his second wife Ranjana (Soha Ali Khan) honed her passion for alcohol. Uday Pratap Singh (Dutt) is the son of another royal family of Rajasthan, whose ties with his father (Kabir Bedi) and brother (Deepak Tijori) are strained. Uday is in love with the beautiful dancer Suhani (Chitrangda Singh). As with the earlier two films, here too someone is lusting after someone he ought not to be eyeing, several players in the story are bitter, and some are planning revenge on those they resent or hate. Given that two-thirds of the principal cast is the same, you would think that this is a safe formula, but nothing is foolproof in the absence of solid writing. Except for a couple of clever dialogues like the one quoted in the first paragraph, and Madhvi, the rest of the lines and characters are barely developed and lack spark. Madhvi’s actions in her first few scenes are laugh-out-loud hilarious and cheeky, which is exactly what we have come to expect of this volatile creature who is unapologetic about her sexual appetite and her anger towards Aditya. Sheirgill is sincere as always, but suffers because Aditya’s graph lacks fizz. Still, the structuring of their first scene together on a terrace is a reminder of how effective SB&G and SB&G Returns were because Dhulia was evidently committed to both. Here, the writer-director makes the mistake of forgetting that the volcanic nature of the first two SB&G films came from the gangster entering the Aditya-Madhvi relationship. Irrfan Khan and Randeep Hooda (who was in Part 1) are among Bollywood’s finest actors. Dutt is an able actor who gave up trying a long time ago. In the absence of an explosive third angle in this triangle, the story moves along mechanically with a handful of somewhat interesting turns but no major plot point worthy of a gasp. The editing, which was such a strong point of the first two films, is lackadaisical here. The music is run-of-the-mill unless you insist on counting the brief use of the gorgeous classic Lag ja gale. And the sound design and editing in a fight scene involving Uday in his father’s palace is slapdash enough to draw the attention of even an inexpert ear. To be fair to the film, it does manage to summon up an eerie atmosphere of foreboding through its background score by Dharma Vish, along with DoP Amlendu Chaudhary’s low-lit frames and Dhananjoy Mondal’s production design in the corridors and gloomy rooms of Aditya and Madhvi’s palace. And Gill does still manage to make Madhvi a character deserving of a viewer’s emotional involvement. The film could have been so much more than the passably entertaining fare that it is if Dhulia and his co-writer Sanjay Chouhan had spent more time polishing up her story and fleshing out the multiple characters around her, including Uday, rather than leaning on Dutt’s stardom for support. Sanjay Dutt is not Salman Khan whose films may often lack depth and sensitivity, but who absolutely has to be credited for being completely invested in his fandom and in maintaining himself. Sanju Baba has rested on his laurels and his natural charisma for too long to be trying his hand at this stage at those self-referential lines and inside jokes that seem to resonate so well with Salman fans (even if they are now boring to critics and non-fan audiences). Here he tries a Salman on the viewer when his character says: “Zindagi ka mazaa humne bahut kam liya hai. Ab waapas lauta hoon. Zindagi bhar ka mazaa loonga (I have not lived life to the fullest so far. Now I am back. I intend to enjoy a lifetime of happiness).” Coming as they do on the heels of the indulgent biopic lovingly crafted for him by his good friend, director Rajkumar Hirani, that has been a box-office blockbuster, these lines brim with Dutt’s desire to make a comeback in the public eye. He has a right to that ambition, but why was a filmmaker capable of such lovely works as Haasil, Paan Singh Tomar and Raag Desh, unable to see that the actor lacks the fire to hold up a weak script? REVIEW 614: FOR HERE OR TO GO?